Deputies assigned to the Major Accident Investigation Team are investigating a three vehicle crash in St. Petersburg. The crash occurred at 12:49 a.m. on Tuesday, September 11, 2018 at 38th Avenue N and 34th Street. Deputy Christopher Ludtke was on-duty in his fully marked 2010 Ford Crown Victoria traveling eastbound on 38th Avenue North, and stopped for a red light at 34th Street North. While stopped at the red light, Deputy Ludtke’s vehicle was directly behind 38 year-old Shannon Clark’s 2005 Dodge Neon. Both vehicles were in the median lane. Investigators say, 32-year-old Zachariah Johnson, was driving his 2016 Hyundai Elantra, eastbound on 38th Avenue North. 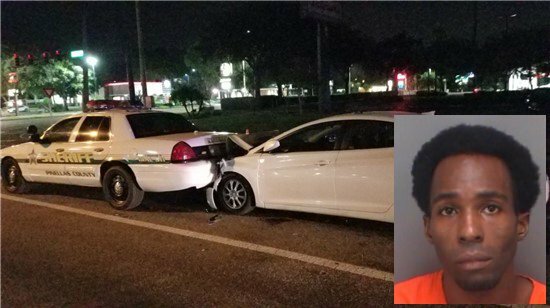 Johnson did not stop for the red light at 34th Street North, and crashed into the rear of Deputy Ludtke’s vehicle. The impact pushed Deputy Ludtke’s vehicle into the rear of Clark’s vehicle. Deputy Ludtke was transported to a local hospital with minor injuries. Clark and her passenger were assessed on-scene by paramedics and refused medical treatment. Investigators say that Johnson showed signs of impairment at the scene of the crash and provided breath samples, which indicated he had a BrAC of .159/.171. Johnson was arrested and charged with DUI with Property Damage and No Valid Driver’s License.